There is more research on healing than on most of the other complementary therapies. Studies in other species demonstrate effects on wound healing, cancer growth, growth of plants, bacteria and yeasts, and influencing cellular and DNA functions. ﻿﻿David Daniel - Healer - talks about his experience working in a Healing Centre and how healing has helped people. Marie Withers - Former cancer patient tells of her experience with healing. Coral Gardiner PhD - Educationalist- talks of the benefits she gained through healing. ﻿Carol Waite – Healer –..
﻿﻿ David Daniel - Healer - talks about his experience working in a Healing Centre and how healing has helped people. Marie Withers - Former cancer patient tells of her experience with healing. Coral Gardiner PhD - Educationalist- talks of the benefits she gained through healing. ﻿ Sandy Edwards – Healer- talks about her research in hospitals. You can download this file as a PDF here Scientific Evidence that Spiritual Healing Improves Health by Sandy Edwards A controlled medical study was conducted to evaluate the effectiveness of spiritual healing provided by Healing Trust members. 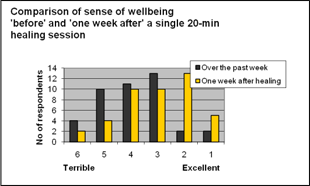 With 200 NHS outpatients each receiving five weekly sessions, this is probably the..
A controlled medical study was conducted to evaluate the effectiveness of spiritual healing provided by Healing Trust members. With 200 NHS outpatients each receiving five weekly sessions, this is probably the largest healing trial in the world. The research was led by the University of Birmingham (a Russell Group university), known for first-rate research, in collaboration with Freshwinds, a Birmingham medical charity. A grant of £205,000 was awarded by the National Lottery to fund the project. The following two research papers have been officially published in medical journals. These online journals offer open access to the full text, which can be reproduced so long as proper attribution is given to authors and to the journal concerned. The main, quantitative paper reports that patients benefited physically; their symptoms reduced. It also identifies that their quality of life was enhanced; they felt better in themselves and were more able to lead a normal life. Whether measured by score improvements, effect sizes or statistics, results revealed significant improvements regarding symptoms and wellbeing. Improvements were found to be long-lasting and may have continued beyond the period of study. In addition, the researchers confirmed that the level of these improvements was substantially more than could be expected from placebo. The researchers concluded that a study should be conducted to investigate whether adding healing to conventional healthcare would reduce NHS expenditure. The secondary, qualitative paper focuses on what patients had to say about their experience. Their comments support the findings of the main paper. Many of them talked about coping better with their condition, and they reported feeling uplifted and more optimistic. 15. The researchers concluded that future research should aim to determine whether adding healing to conventional care would reduce costs. Watch individual interviews with medical professionals who endorse and support healing. You can download this file as a PDF here These are the results after 192 people (the vast majority being gastroenterology outpatients) received a single 20-minute healing session at Good Hope Hospital by Sandy Edwards sandedwards@gmail.com Following on from my previous hospital audit of 75 patients, the questionnaire for this.. Following on from my previous hospital audit of 75 patients, the questionnaire for this second audit was slightly altered and makes a total of 267 patients whose response to spiritual healing has been recorded. The first audit was used as evidence towards a research grant application that was successful in gaining £205,000 for Birmingham University to research our healing work at Good Hope Hospital. Work on this project will conclude in 2012. None of the patients, in either audit, were looking for healing. They were simply recommended to it by their consultant during their consultation with him and consequently received a healing session immediately afterwards. Only a tiny proportion of these patients had accessed a complementary therapy of any description previously. The Department of Health’s document ‘Complementary Medicine Information for Primary Care Groups’ (www.doh.gov.uk/cam/index/.htm) reports that ‘more than one in three adults’ use one or more of the 8 therapies that the DoH named during their lifetime. Clearly, these figures are in no way reflected amongst the 267 patients included in my 2 audits, which leads me to suggest that people who embrace complementary therapies may be less likely to be troubled by a condition that warrants a consultant. Anyone with IBS, psoriasis or eczema knows that their symptoms get worse when they are stressed or worried. This tells me that a physical chemical reaction is taking place in the body as a result of their negative emotional state. 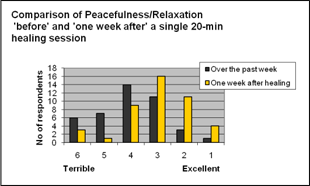 Healing deeply calms people but there is more going on than simply relaxation or placebo. For instance, research shows that healing works under laboratory conditions on human tissue in Petri dishes, and also on animals and plants. See www.thehealingtrust.org.uk for research articles. The first part of the questionnaires were completed after the gastroenterology patients had seen the consultant and before the healing session. 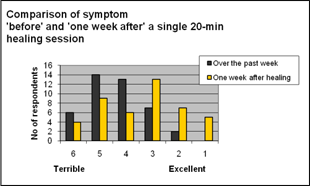 The black columns show how patients felt over the previous week. 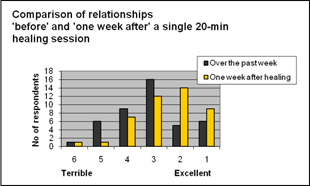 Figs 1, 2 and 3 show an improvement between ‘over the past week’ and ‘before healing’ (ie the grey columns), which suggests that patients benefited from their consultation. 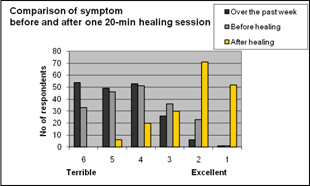 The gold columns show the difference they reported after their healing session. 76 Feel great comfort when healers hand on lower belly. Also on the shoulders. Feel marvellous. 77 Saw purple light. Dark clouds moved away. Cramps developed but disappeared. 78 When healer touched abdomen (solar plexus) could feel bloating and letting go of it. Left wrist and elbow area went very warm. Coughing during healing. Eyes watering. 81 Very relaxing. Tingling around right thumb and (at the same time left hip and side). Shoulders had been tense but now fine. 83 My stomach started making noises and moving, twitching legs. 85 Tingling and twitching in left hand. Heat in right hand. 89 Felt benefit immediately. Felt ripple move through body from pelvis right up through body. 90 Surprised me. Knee feels much better. 91 Very good indeed. Back pain disappeared. 92 Feel much better. Thank you. 93 Total peace of mind. Was very stressed and agitated before hand. 96 Very good – really enjoyed the session. 98 A truly wonderful healing session. 99 Existing ache disappeared. Did experience floating – it was nice. 100 Amazing. Felt intense heat. 101 More relaxed. Discomfort has disappeared from chest and wrist. Feel no pain. 102 I feel more relaxed now than I have for a long, long time. Thank you so much. 103 I feel 100 times better than I did when I came in. Thank you. I felt my muscles jump and tingling and my shoulder went very hot and the pain eased. 104 Very relaxed. Felt I could have floated away. 105 I could not believe how good it felt. Reduced pain felt as though kidney was floating. 106 Very relaxing. Felt things “unknotting”. 108 Good experience – positive. 109 Very good. Belly undulated dramatically on several occasions when healers hands on that area. 111 Very relaxing. Feel energised, wide awake. 112 Felt totally blessed. Had three jerking experiences. Completely de-stressed. 115 Made me concentrate on positive attitude. (Wanted to feel well again). 116 Excellent relaxation. First time for me. I will pass on. It gives you a wonderful feeling. 117 Relaxed and glowing. Aware of a pulsating purple to golden (glow). 118 Mentally more stable. Nice and floaty. Thank you so much. 119 My first session. A big weight has lifted and I felt little stars from top to bottom leaving me. Arrived with cough which has now settled. Pain in stomach gone. 120 Relaxed warm floating. Haven’t felt like this for a long time. Wonderful. Feel more human. Like having all your Christmas and Birthday presents all in one go. 121 Felt twitches, heaviness as though had long sleep. 122 I think improvement would come with more sessions. 123 Feeling a bit high. Back rib pain occurred during session (always get this when lying down). 124 Very good session. Very enjoyable. Felt slightly sick afterwards, as I usually do when meditating. existing headache became worse then better during session. 125 The feeling of refreshed and peaceful. 126 Pain in left chest reduced through session. Very good. 127 Comfortable sensations whenever attention brought to particular parts. 130 Felt heat in my belly, shoulders. Heaviness felt during relaxation. 131 Tugging pain in left rib cage disappeared and also neck/shoulders easier to move and no pain. 132 Relaxed and calm. Thank you for your kindness. 133 Helped me think about the good in my life. 135 Very good. Relaxes me. 136 Very emotional and tired. 137 Brilliant. Amazing. Never felt so relaxed in my life. Feeling tingly all over – it’s wonderful. 139 Wonderful. Thanks. Feel lighter, brighter. Tingled during session. Felt Warmth. Feel like had full night’s sleep. 141 Chest has always felt tight but doesn’t now. 142 Felt coldness throughout. Very relaxed. 144 Haven’t been so relaxed in months. Sensation of a knot in solar plexus appeared during healing and melted away. Blue and red balls of colour in a grid form appeared in lower right leg (where injury had been) which disappeared. Pain in right side, mid-section disappeared during session. Felt very heavy. Emotion emerged and passed quickly. Fantastic. 145 Amazing green light – Thank you. 147 Honestly feel more alert. Thank you so much. Lovely. 148 Legs were cold, but now feel warm. During session recalled self as small child in black dress and handkerchief in right hand feeling pleased with myself. 149 Feeling relaxed and peaceful. Thank you. 150 Intense heat across shoulders and back when healer’s hands on abdomen. Felt heat down left leg which has been a problem. Very relaxing and positive. 152 Felt lots of warmth, especially in back. Also numbness and a wave of something passing through. Excellent. 153 Felt really good. Warmth, like a warm drink, in lower belly – like Ready Brek advert! Really enjoyable – like a different world. Really relaxed. I thought I was peaceful when I arrived but during the session realised that I was releasing tensions. 154 Felt as though had deep sleep. Feel warmth everywhere. Healer touched shoulders and arms. Twitched at first. Eyes flickered throughout. 155 Felt warmth throughout, especially where healer’s hands in contact (hot in shoulders, abdomen and knees). Tingles throughout arms and legs (different to normal tingles). 156 Ankle was throbbing but not now and not half as aware of it as before. Healer’s hands felt cold (refreshing cold) though actual temperature of hands was normal. Wonderful and revitalising. 157 Felt hot for some time. Towards end felt an inward rushing of ‘lava’ like substance. 158 Exceeded my expectations. Felt very positive experience. 159 Tingling in neck/heat in pelvic cradle and head. Movement in pelvic cradle. 160 Right hand and left foot tingled. Right knee twitched. Feel quite relaxed. 161 Very peaceful and refreshing. 162 Ache in shoulder appeared during session and released with sensation of heat. Stomach had bloating and tightness before session, which released significantly. Was cynical before but now want to access healing again. 163 Have come back for healing as it was so fantastic and energy levels high, clarity of thought for 5 full days, peaceful. Heat in tummy and right knee. Tension in shoulders disappeared. 164 Normally I want to constantly fidget but stayed very still during entire session. Very peaceful and calm. Felt heat from healer though her hands were cold. 165 Felt heat in stomach and left shoulder (which had been aching). Also heat in heart area. Had almost always been aware of ‘lump’ in chest as though swallowed a hard sweet but not as severe now. 166 Deeply relaxed and warm. 167 Felt asleep but aware that some part of my mind was picking up the words that were said. Burning in stomach disappeared. Right shoulder developed an ache but it disappeared. Was sceptical that it could work. 168 Feels like hot water bottle on lower belly. Feeling more tired now than before. 169 Had unpleasant visions during session that resolved ending in purple light. Tears and weeping during session. 171 Aware of heat in neck/head and discomfort reduced. I don’t want to get off couch. Lots of blue light. Heart pounding at beginning but gone now. 172 Marvellous. Felt relaxed enough to sleep during session. Discomfort emerged during session but passed and now feels warm throughout. 173 Tears came during healing. Feeling weaker and more tired than before. Just want to go to bed and sleep for ages. 174 Enjoyed it. Relaxing. Certain areas looked (with my inner vision) as though blocked but improved during session. 175 Feels like a ton weight lifted. Could not feel healer’s hands on my body – only heat in the areas where there had been pain, which felt like very hot water bottle. I look forward to coming for healing sessions. Feel great now. 176 Feel wonderful – great shiver of cold from neck down. Tickling sensation (or pressure) in the head, mostly on the right hand side. 178 Doesn’t feel as though my body belongs to me. Aware of heat around head as though under a lamp. Heat on right especially. (Healer aware of body twitching, but patient not). 179 Aware of heat in pelvic right hand side. Aware of red, yellow and orange. (Husband was present and his back pain disappeared). 181 Waves of feeling perturbed but seems to have lessened quite a bit. Went really dark and cold at one point which passed. Involuntary tears flowed. Twitching in knees. Left side of body not as relaxed as right side. 182 Had discomfort in abdomen that disappeared. 184 Felt extreme heat where throbbing ache had been. Felt extreme cold immediately after session and dragging sensation. 185 Brilliant. Aware of sudden release of tension in pelvic area. 186 Tingling in right hand. 187 Felt extreme heat in and around head and shoulders and in the pelvic area. Felt extreme cold immediately after session. 188 Pain in right shoulder and right hip disappeared. Pins and needles down right hand side. 189 Felt more and more relaxed. 191 Felt as though pain was being drawn out of me. Tingling all over at the end along with emotional release. So relaxed now! 193 Tingling in arms and right leg. 194 Hands and arms tingling at beginning also legs and still feel tingling. 195 Released emotion. Felt icy cold where discomfort had been. Warmth around head area. 196 Feel lighter. Felt heat. Muscle jumping in right leg and in both arms (left leg amputated from the knee). Eyes watered. Amazing. Felt as though something (anger?) lifted out of me. 197 Enjoyed the session. Mind wondered but kept bringing it back. 198 The area felt clogged up before but now more “spread out” (in a positive way). Very nice. 199 Aware of greenery and the feeling of it inviting me/making me confident of making changes in my life. Purple came in later and also blue. 200 Felt a bit weird when healer on left shoulder. Aware of image of me being like in blue box under water but no water (lighter on sides than top). Little blotches of light at other times. 201 Very warm wherever healer was working. Stomach ache gone and relaxed. 202 Arms felt so heavy. Felt they were below the couch. Aware of blackness throughout. 203 Felt a lot of warmth. Feel more relaxed. 204 Felt real warmth (hot!). Couldn’t believe it. Everything black but could see glowing hands (made of light) moving around body. 205 Very relaxed – almost went to sleep. 206 Felt as though floating and a sense of freedom. Was running through a field of knee-high flowers. 207 Very good. Tingly feet and feet went cold for a short time. 208 A pain in right of neck and light headedness that I came with has gone. Enjoyed session – could do with everyday at my house. Pain in abdomen is reduced now to an ache. 209 Found it difficult to relax but at one point was so relaxed that I was completely unaware of my body – only my head. 210 Tired now. Just total relaxing. 211 Very good. Fell asleep. 212 Little lights and tingling, especially around legs. Weird as though weight lifted from pelvic area up through body and gone. 213 Feel energized, positive and relaxed. Healer’s hand vibrated when on left shoulder, which has been painful recently. Aware of purple-ish, bubbly clouds around the head. 214 Tingling and pain and heat in shoulders. Heaviness in solar plexus. Sank through body into bed then felt as though floated up and out of body. Saw dark tunnel showing my white body fitted into dark which became light. Pain left and tingling. Feel weird but great. 215 Really cold feet, tops of arms and fingers. Heat in parts. Feel as though I’ve just woken up but I was aware of everything so I know I wasn’t asleep. Saw orange and white. Feel weird in a good way. Feel happy and energized like I could run a marathon. 216 Feel as though had a deep sleep but aware of everything. Warmth throughout body. 217 Felt very cold top half and then spread throughout. Warmer later when healer’s hands on one shoulder. Sharp pain in one ear and tooth that then disappeared. 218 Felt calming. The benefits of healing stayed with me for a long time after the session I had last year. 219 Throat feels eased. Visualised bright lights in throat (clear yellows/white) as directed. 220 Tired and could go to sleep. Stomach improved. Felt heat in that area. 221 Pains throughout legs and feet disappeared for a time during sessions and returned after the session. 222 Felt shoulders melting into relaxation when healer’s hands on them. Tummy felt nice warmth. 223 Mind blowing. Tingling sensation as though negativity was being brought out, though initially I was fighting what was being suggested completely. I feel a bit stronger. 224 Felt as though deep sleep although could hear people/traffic outside. Feel a lot calmer now. Felt fluttering in area where IBS symptoms have usually been. One leg and I hand had muscle jumps (sometimes does when I relax). 225 Neck, throat and right shoulder and head felt full of wool and as though couldn’t move or swallow but actually could (and did!). At another time hands felt too heavy to move. Feel as though could go for a good sleep. 226 Felt tingling where healer was touching. When lying down, I usually hear my heart beat quite loudly but was a lot less during this session. 227 Felt heat from healer’s hands even when not touching. Didn’t relax as well as I thought I should have, but it’s the first time I’ve done this. 228 Felt warmth in area that had been painful when healer’s hands on that area. Just perfect. 229 Feels like a weight has gone. Really nice. Excellent. I feel more alive. 230 Purple clouds with black background changed to purple background with little bits of black that drifted away. Headache gone. 231 Tingling in arms. Purple light seen by left eye. Right eye was seeing the healer (even though my eyes were shut) in white light. 232 Felt as though lit up to begin with and felt a little afraid but this passed about halfway through. Turmoil has changed to calmer feeling. Then golden light with purple appearing in the middle. 233 At beginning, lights and red and green continually flashing out from body. Felt as though healer was golden blob. Another golden blob appeared then quite a few more appeared. Saw golden hands with extended long fingers of gold. 234 Absolutely relaxing – like I would feel when on holiday. Tingling in end of fingers which became throughout whole body. 235 Waves of energy from head to foot during the first half, then up again afterwards, relating to hand positions of healer. 237 Head and hands pleasantly tingling mostly during the middle part of the session. 238 Feeling more positive, tingling in arms and shoulders and legs. Quite surprised at peace of mind throughout session. 239 Never experienced something like this before. Enjoyed one-to-one experience. Everything is tingling. 240 Very useful for relaxing body and peace of mind. 241 Magical experience and helped a great deal as the pain has literally gone. 243 Took a while to switch off but then was able to relax fully for deeper and longer than I can remember. I feel more positive, felt warmth in legs. 244 Felt tingling, heat and cold. Lots of movements in belly (gurgling and bubbling). 245 Wasn’t able to imagine light. Mind full of day to day things – found too hard to concentrate. 246 Irritation on the surface of the belly disappeared (where the MRSA had been). 247 Warm glow in arms and chest. Tingling in arms and legs. Eyes watered. 248 Aware of golden light throughout session. 249 Feel much better – more relaxed. 250 Saw golden light. Tingling in my face. 251 Felt worried for healer throughout. Heat and comfort in pelvic cradle and half way through and became more intense. Became the most relaxed that I’ve ever been in my life. 252 Warmth throughout except feet. Lilac throughout. When healer worked on feet, aware of lilac and green. When healer worked on groin to knee, felt blood flow which made knee ache. Right eye has been a problem for 2 years. When healer was working in that area, it was as though a sharp needle (that didn’t hurt) had pricked the right eye and feels better now as though cleared. 253 Clearer headed. Felt warmth when healer’s hands on stomach area and back of neck. Felt light-headed and woozy when got off couch, which cleared in a few minutes. 255 Very calming and feel just at peace. Don’t know how to explain the feeling. 256 Felt as though areas were gently being “wringed”. Healer’s hands felt warm on the joints. Very comfortable. 257 Warmth in pelvic and tummy area when healer is on that area. More than when hands were on other areas. 258 Soon relaxed. Didn’t worry about a thing. Warmth in the belly. Felt chilled out. 259 Orangey/white tiny dot of light appeared from the right hand side which came and went over and over during the session. 260 Came with extreme pain in left leg and hip but disappeared at the beginning of session. Had the sensation of leg and hip being in lapping water. Extraordinary! 261 Excellent! Had arrived with trapped nerve pain from neck to r.h. which disappeared. Also had distended stomach which has noticeably reduced. Wow. I can’t believe that arm is normal again. Felt as though I dropped off to sleep a few times. When healer was around the head area, felt pressure (even though healer not touching the area) and thought it would develop into a headache but simply disappeared instead. 262 Felt that I’m much better than a month ago (had pneumonia). Felt heat in the part where the pain was (barely there now). When healer touched felt at the beginning felt tingle in hands. Later healer touched feet again and I felt tingling in base of head. 263 Everything seems much better wherever healer’s hands had been, they left a warmth as though they were still there. 264 Aches in every joint disappeared except for in r ankle and bottom of foot. Felt happiness. 265 Tingling throughout the left hand side of body nearly all the time during the session. 266 Shoulders feel freer and lighter. Feel really relaxed and a lot better. Very pleasantly surprised. Really chuffed. Can’t believe how much better I feel. 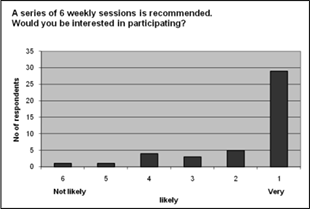 268 Felt concerned about the consultation, but feel better now. Bizarre! Didn’t expect it to work as well as it did. Tingling in hands mostly and both arms. Loved it! 76 There was a change to the bowel movement until mid-week, then the panic situation returned. 77 I felt a lot calmer, more peaceful – not rushing around so much. 83 Had some upset in the last week. Felt very relaxed, but energised for the first couple of days. Did feel the benefit and would really like more. 86 Moving house at the moment but been very relaxed. 87 Felt better for longer. Only felt worse the last couple of days. I feel it’s really making a difference. 89 Went on holiday to Egypt straight after session. Felt real benefit. Able to cope with hassle from locals. 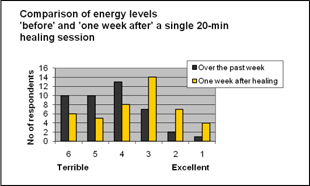 I have benefited from session four weeks after. Much less anxious. 92 It is nice to know that underlying problems can be resolved through having a healing session. 93 Even more stressed than usual due to family pressures and illness. Very happy to be part of future healing sessions. 94 Treatment did little for me. My mind was probably on the news I had just been given. 98 Before healing session, felt terrible and was a different person afterwards – an amazing session. 99 Will make an effort to make time for future healing sessions and to give it a go. I quite enjoyed the session at Good Hope. 100 Amazed that, at the moment, I have no pain ! 107 Lost weight but still smoking. 108 Have not felt like myself in some situations, but everyday anxiety has been better. Have felt calmer and am willing to try anything that will help. 111 Would benefit from further treatment. 114 I just can’t seem to relax my mind enough to find the sessions helpful. 117 I believe I did feel a benefit from my healing session – maybe for 48 hours after that – back to how I feel now. The use of earplugs or earphones to subdue everyday noise, but to still allow you to hear the healer speaking. A quiet environment I feel is essential and to be dimly lit. 128 This treatment helped a lot with stress and sleeping. 133 More peaceful at home. 134 Very relaxing – thank you. 137 Since the session I feel much more relaxed in general. 138 The relaxation class was lovely, but still suffering with the pain in the bowel. It did me good at the time, but has not improved the pain in the bowel. I will try anything. 139 Even though my symptoms have not changed, it gave me a sense of well-being on the day. Very relaxing and likeable. 141 I have been sleeping well for the past 2/3 weeks. I have been feeling well in myself. Since the session and having one counselling session, I have come on in leaps and bounds. I would like more sessions as I need to overcome my fear of heights. 143 There has been a positive effect and hopefully this will get better. I do find it very beneficial but would like regular sessions. 145 Have felt more relaxed and calm. 153 Did not feel as good as the first time I had a healing session. 156 Unable to relax as much this time. Still found it enjoyable. Am eager to participate in anything that may be beneficial. 160 Have felt more able to relax and get problems into perspective. I think to carry on with sessions can only bring more improvement. Would definitely like to attend further sessions. 165 After having healing I felt as if it had just disappeared. I will come to healing this week. The only problem taxi costing £15. 166 I feel I can cope with situations a bit better now. Sandy helped me a lot. I would recommend Sandy to anyone and would like some more healing with her. 168 Last Wednesday felt good apart from dragging sensation. Went to Sutton but found two hours around town was enough. Never been able to go around town on my own since October 08, but did so for 2 hours after session. Slept best ever since August 08. I’m hoping to carry on just for peace of mind from this dreadful feeling in abdomen. 169 This has been a journey of discovery for myself and awareness of other things re events/situations. Very beneficial to everyone – myself included. I’m indebted to you. Thank you very much for your help. 170 I do feel relaxed having healing when lying on bed. Thank you for the CD – it’s nearly worn out! 171 Due to my various conditions I feel that I would probably need to try several sessions to experience a positive result. 172 Thank you for your help. 173 A very big thank you to Sandy. Enjoy my session with Sandy. It helps to relax me, but as soon as I start walking it starts again. 174 First few days felt exhausted and still in lots of pain, better the latter half of the week. 175 Fine for the rest of the day and also the following day. 178 Symptoms were bearable after the session, also the following day then gradually downhill. By a week later symptoms were back to being horrendous. 187 Healing does help to relax me. 199 I have felt very relaxed. 202 I have felt a lot more relaxed and have been able to sleep well most nights. However, I am still tired all the time and so find it hard to concentrate well, although this has improved a lot. 203 I have not noticed any significant change. I am not sure if this treatment would work. It is probably very individual. I am very grateful for your help and I am prepared to try any treatment. 204 I found the first session very enlightening and relaxing. 207 I have noticed a vast improvement since the healing session. I would like to thank the healer greatly for the session. I found it to be very helpful indeed. 210 The symptoms were less troublesome after the session until the last 24 hours (for 6 days). 214 I would participate tomorrow (in healing sessions) given the chance. 220 In myself I have felt a little better but sickness is still there. 222 I have tried to recreate the feeling of inner calm and had some success. Thinking about what the healer said to me during the session has made me look differently at my symptoms. I feel that could benefit from these sessions and would be keen to try it out. 224 After the first healing session, I felt good for a few days, then the IBS started again. 228 Felt a lot more relaxed this week. 230 Don’t feel quite as relaxed as I did last session but I do feel not as fed up. 231 Felt really good to start with, but life makes the symptoms gradually return. Learning to manage them. Healer was excellent. 238 The following day my pain returned the moment I woke up, but I did have a day without pain. 241 The treatment helped me to relax. I feel one to one healing is better for me and I feel that I could get more from this kind of healing. 242 Very much better, less pain. 251 Felt good following session, however as week progressed symptoms intensified. Following conversation and session I have taken a different line with people who are stressing or pressurising me. 252 The day after my healing session (19 November) I was in considerable discomfort still – mainly in leg, difficulty walking on left foot too, no quality sleep. 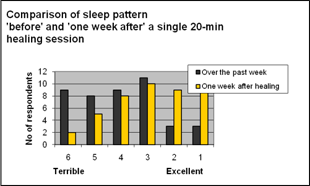 However (20 and 21 November) no pain whatsoever during the day, no pain whilst sleeping – uninterrupted sleep. Unfortunately, pain and all associated symptoms have now returned with a vengeance. I would be very grateful to be included in any healing sessions. 256 I do not consider any benefit to be sufficiently noticeable and as attending, driving, parking trauma would make it self-defeating. 259 Since having this session, I’ve been constantly eating fruit. From having one piece every two weeks, to over my 5 a day. I felt very sick half an hour after the session, but since have had a constant craving for fruit every day. Monday this week, I just ate fruit all day. Before, I struggled to eat an apple once every two weeks. I eat chocolate every day, and for a week after I hadn’t touched a piece. Usually I would eat lots every day, even though I still feel unwell. I really think this session has made this happen. Many thanks. 260 I found it to be much more beneficial than I had thought it would be. Keen to participate. 263 Many thanks for the opportunity of seeing your healer on my last visit. It left me very relaxed. 267 Although scoring is negative, I am not responding in knee-jerk way to pressures placed. I have actively sought measures to reduce stress and feel better for it. Initially I was sceptical but the session proved wholly worthwhile and points out things the person doesn’t always see. Thank you for being a man with incredible vision.